True confession. I love PB. I eat it almost every day, making every day peanut butter day! In fact, I’m eating a spoonful right now with a banana. It’s the perfect desktop snack. I hope to turn you into a PB lover too!. Peanut butter. Those two words probably bring up lots of memories. School lunches? Making (or eating) homemade peanut butter cookies? Or maybe you’re thinking about how controversial eating peanuts and peanut butter has been over the last 20 years, especially for moms-to-be and their young children. The good news is that peanut butter and peanuts have risen to the top of the “Foods to Eat Now” List! Peanut butter can cut the risk of allergy. Peanut butter used to be the food to avoid the first year of life to avoid peanut allergy. NOT ANYMORE! In January 2017 an expert panel sponsored by the National Institute of Allergy and Infectious Diseases (NIAID) issued guidelines that recommend early introduction of peanut-containing foods to infants. The reason? To prevent the development of peanut allergy. What?! Yes, the expert panel actually recommends that infants at high risk of developing peanut allergies have peanut-containing foods introduced into their diets as early as 4 to 6 months of age to reduce the risk of developing peanut allergy. (Parents and caregivers should check with their infant’s health care provider before feeding their infant peanut-containing foods.) Find the guidelines written for parents and caregivers here. Also, eating peanut products during pregnancy cuts the risk of peanut allergy in childhood. Rising peanut allergies pushed us to think that avoiding common allergens during pregnancy could cut the risk of allergies. But he opposite is actually true. 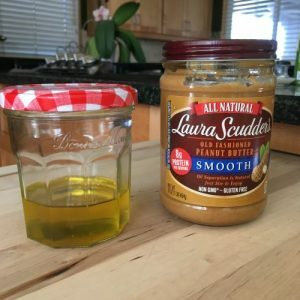 One study looking at 1200 moms and their kids found that eating more peanuts in the first trimester was associated with a 47% reduction in peanut allergy reaction at age 8. In fact, consuming milk and wheat during pregnancy had similar results regarding those food allergies. Read the study here. Peanut products can help kids control their weight. Overweight children given a daily peanut snack had a lower BMI than kids who ate peanuts once a week or less. Both groups received the same 12 week program of nutrition education and physical activity. Read the study in the Journal of Applied Research in Children. It can help control blood sugar throughout the day when eaten at breakfast. You’ve heard breakfast is the most important meal of the day. Even more important? What you eat for breakfast. Eggs and peanut butter keep you satisfied. See the study from the British Journal of Nutrition. Eating peanuts and peanut butter regularly has been associated with a reduced risk of heart disease. Also, when substituted for animal protein, cuts the risk of diabetes. Read more here. It’s vegan and relatively cheap! And it’s not just for sandwiches and cookies! PB is very versatile. From smoothies to Asian sauces, from healthy snacks to coatings for chicken and fish peanuts can add healthy nutrition to just about anything! Check out these recipes that are perfect for Breakfast or Snacking! These smoothies work for breakfast or for post-workout recovery with their potassium and protein-rich goodness! 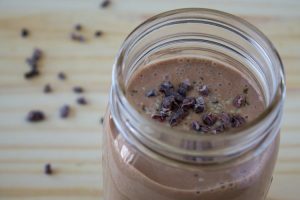 This Chocolate Peanut Butter Oatmeal smoothie from The Foodie Dietitian Kara features coconut milk, peanut butter, banana, cocoa and oats. Yummy! 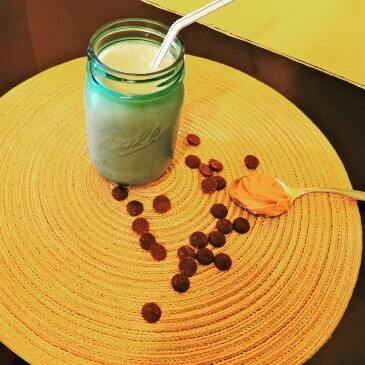 Next is a Chocolate Peanut Butter Banana Protein Smoothie by Lauren, a dietitian specializing in weight management. It features almond milk. This is her go-to breakfast after the gym. 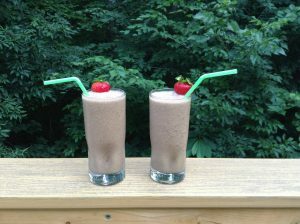 This recipe for a Chocolate Peanut Butter Banana Smoothie is from the PCOS Nutrition Center Cookbook, written by Angela Grassi, an RD specializing in PCOS. 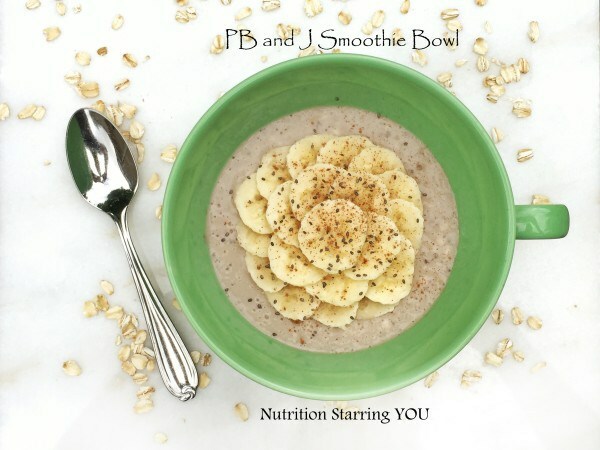 PBJ Smoothie Bowl? Yes! This one from dietitian Lauren features grape juice and peanut butter powder to give you that Peanut Butter & Jelly flavor we love so much! 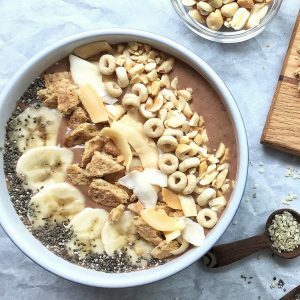 This Peanut Butter Banana Smoothie Bowl from the Liz’s Healthy Table has got a lot of crunch along with soymilk and cocoa for a delicious and nutritious breakfast or snack. Not into smoothies? Not to worry! 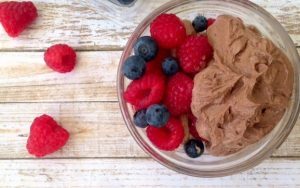 Here’s a recipe featuring Greek yogurt, PB and cocoa–Chocolate Peanut Butter Yogurt from dietitian Lindsey at Tasty Balance Nutrition. Need something you can bite into? Check out these healthy recipes you can sink your teeth into! 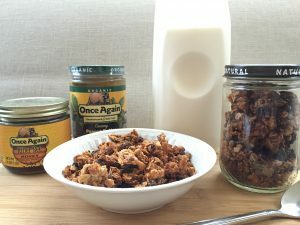 Of course you can buy your granola, but making it means you don’t have to spend an hour reading all the fine print on those granola labels! 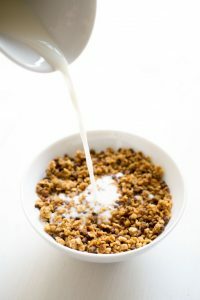 This Homemade Peanut Butter Granola includes honey, flaxseed and raisins from Carolina at Once Again Nut Butter. Cookies for breakfast? Yes! 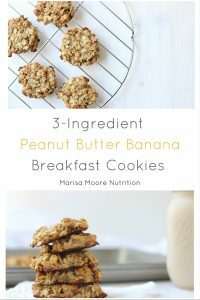 I’m a big fan of cookies and I have even been known to eat a cookie with my tea in what I call my “pre-breakfast!” But no need to feel guilty about eating cookies in the morning when they contain wholesome ingredients like banana, oatmeal and peanut butter like this recipe from Marisa Moore RD. Just add milk for the same nutrients you’d have with a bowl of oatmeal. 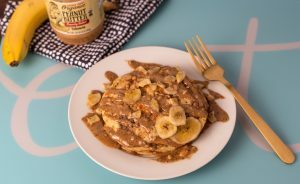 Here is a similar recipe with a few more ingredients–Peanut Butter Banana Breakfast Bake Recipe from Paula at Junk Food Nutrition, that can be made as a drop cookie or pressed into a bar. Are you in a breakfast rut? Do you sometimes get tired of eggs, yogurt and oatmeal? Step up to these Vanilla Protein Pancakes with Chia Peanut Butter Drizzle from Gabriella at Macrobalanced. With 28 grams of protein each, these are sure to keep you full until lunch! 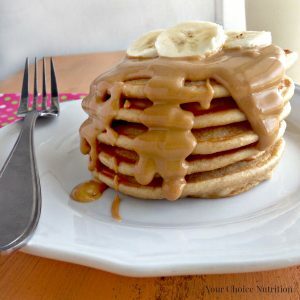 And here’s another pancake recipe, Peanut Butter Protein Pancakes from Brittany at Your Choice Nutrition. For this one, the protein comes mostly from Greek yogurt and milk. Do you tire of trying to find energy bars with the fewest ingredients? So does Liz RD at Better Is the New Perfect, so she created this 5 ingredient No Bake PB Cereal Bar. Enjoy! The warning on this recipe is–they could be addictive! 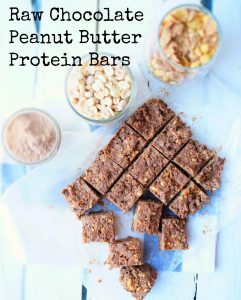 Raw Chocolate Peanut Butter Protein Bars from Liz, Dietitian at Shaw’s Simple Swaps, have got it all. Fiber. Protein. Crunch. Taste. Well, yum! Try these out and let me know what you think! 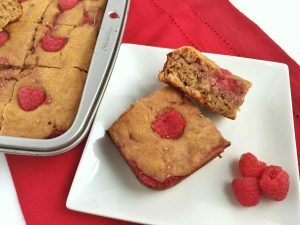 I would consider this last recipe for PB Raspberry Snack Squares from Nutrition Starring You, a breakfast tag-along. One serving isn’t really enough for breakfast, so add a cup of Greek yogurt or have it with scrambled eggs for a scrumptious full breakfast! On the other hand, if you are not a fan of breakfast, these might be perfect! Part Two–Cookies and More–coming soon! « The Power of Being Unplugged: Do You Need a Digital Diet? Thank you for including my PB Banana Breakfast Bake. You’re welcome Paula! Can’t wait to try it! Thanks so much Gabriella! Your recipe looks yummy! 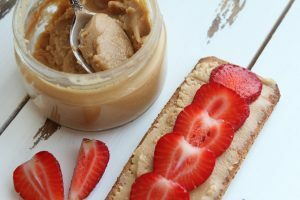 I love it so much… the taste, the texture, the little reminders of childhood when I bite into a peanut butter and jelly sandwich. And now I’m learning that peanut butter is quite healthy and can be prepared in different varieties. Yes– It’s great to know that something you like so much is actually healthy! 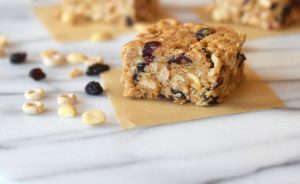 Thanks so much Bridget for including my bars in this great roundup! You’re welcome! They look so yummy!